This pen really IS super fine, in more ways than one. 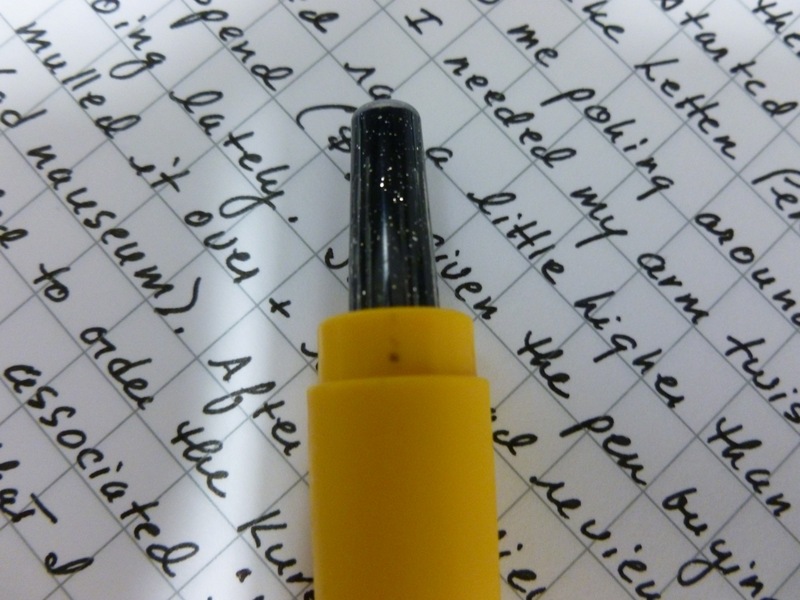 I have to think back– why did I buy this pen? Oh yeah, it was one of those “stream-of-consciousness” pen purchases where I started out looking at one thing, but then wound up ordering something else. The whole thing started when I caught a glimpse of this entry on Ezra Hilyer’s blog. That glimpse led to me poking around on JetPens (not that I needed my arm twisted). The body/refill that Ezra’s showing was a tad pricey for me ($30.00), but it made its way onto my wish list anyway. I read reviews and pondered and mulled it over and read more reviews and mulled and pondered ad nauseum. 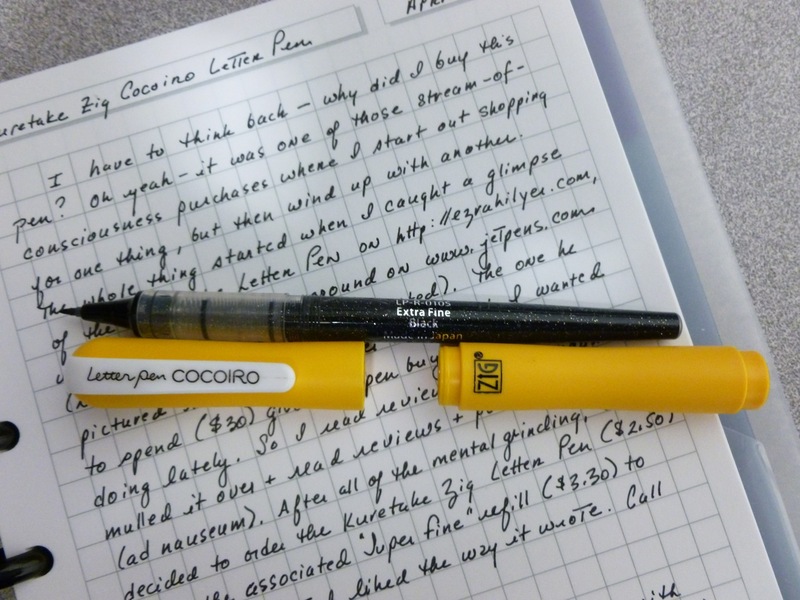 After all of this mental grinding, I came up with a compromise…a comparable writing experience but at a lower price point…the Kuretake Zig Cocoiro Letter Pen. At only $2.50 for the body and $3.30 for the refill, it comes at an easy to justify price. And because I wasn’t sure if I’d REALLY like it, I didn’t feel like taking a substantial financial leap. Problem solved. When my order arrived, I played around with everything…the dark brown Zebra Surari (nice! 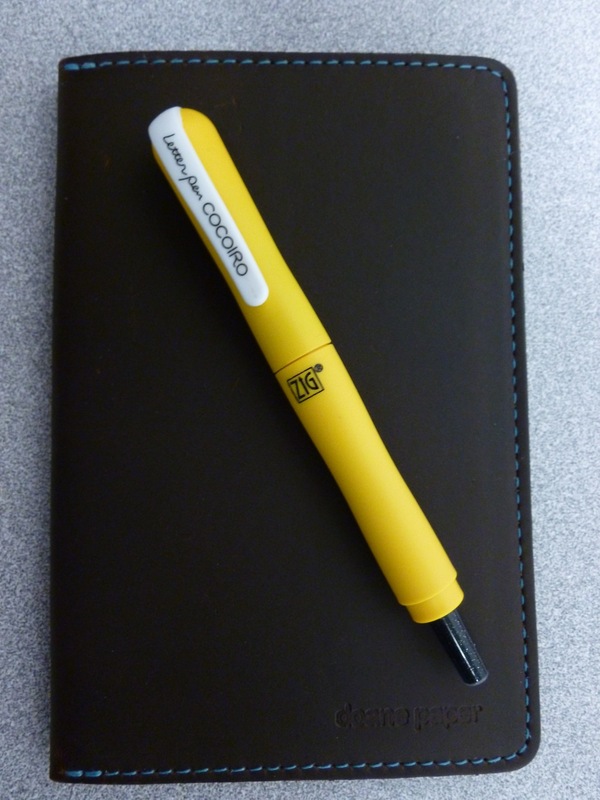 ), the Coleto Hi-Tec-C 4-Color Multipen and 0.3mm refills (jury’s still out on that one), and this pen. It’s just wonderful. The Super Fine tip is almost brush-like, but in a very sturdy way. There is no mushiness, but there is just a little “give.” The ink is black and crisp and flows like a dream. 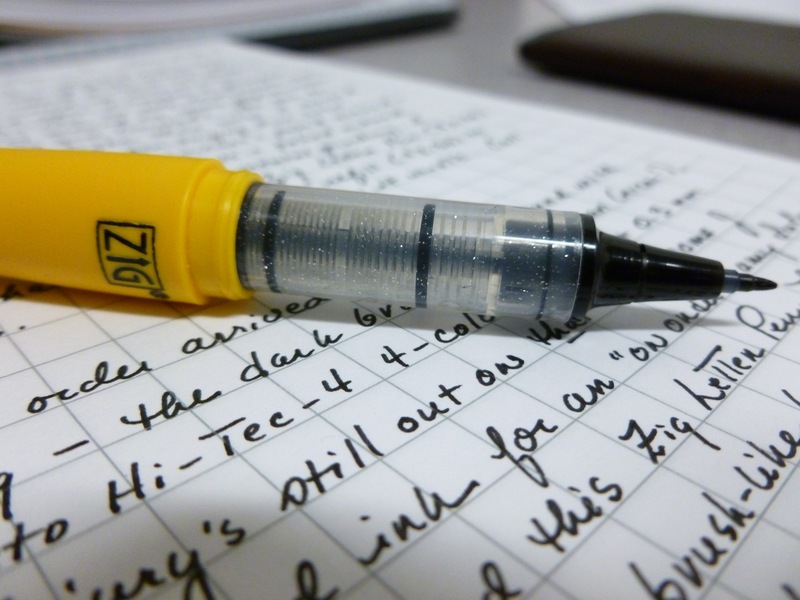 It’s just fun to write with. That said, there is one little oddball part. 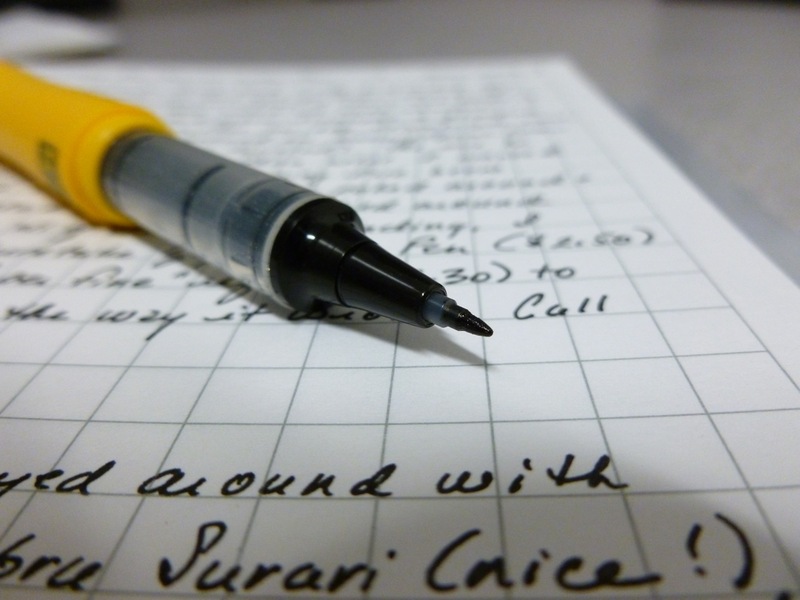 The refill threads into the body very nicely, but, as you’ve probably noticed, the end of the refill protrudes out the end of the pen body when the pen is capped. I do not know why. When the cap is posted, the protruding refill issue/feature goes away. While this design decision nags at me a bit, the pen is just too fun to let it scare you away. I already have my second one picked out. Yup…now THIS one’s on my list. Starry Night Gray with Glitter. Too cool. 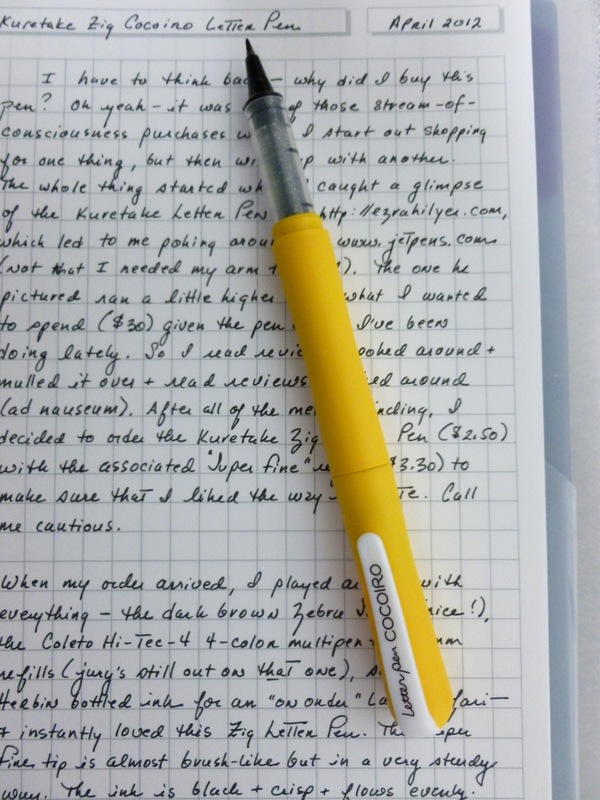 I should also mention that the body takes three types of refills…the Super Fine refill shown in this review, a brush refill, as well as a 0.3 mm rollerball refill. Mix and match bodies and refills. I don’t know how to pronounce “Cocoiro” and I don’t know why the refill is longer then the pen body, but I DO know that you will enjoy this pen. It IS super fine. You have my word.